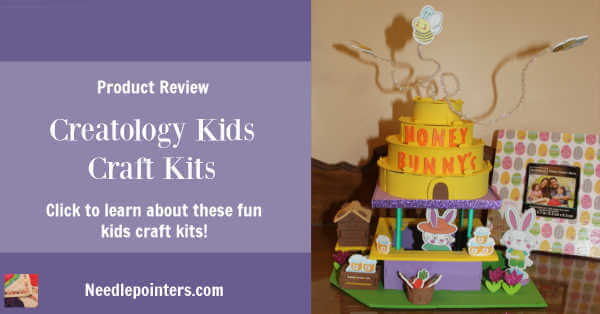 In this post and video we review a few Creatology Craft kits that we purchased. 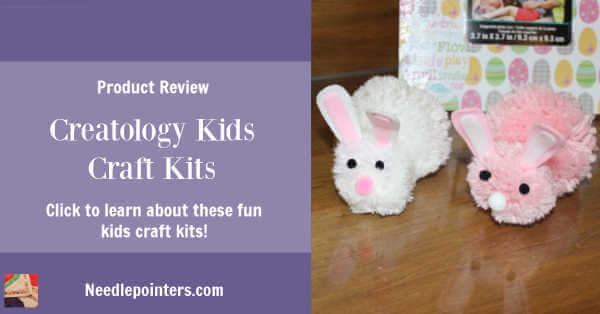 We saw these kits at Michaels and thought that our viewers/readers may be interested in them for their kids as a springtime craft. These would be great to put in the kids Easter basket! 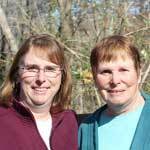 We were not asked to review these kits by anyone and were not compensated for writing this post. Please note that this post contains affiliate links and if you purchase through those links, we do receive a small commission on the sale. It does not cost you any extra to purchase through our links and you help us to keep making more videos. Look for the links to purchase kits like these at the end of the post. Thanks in advance for your purchase! 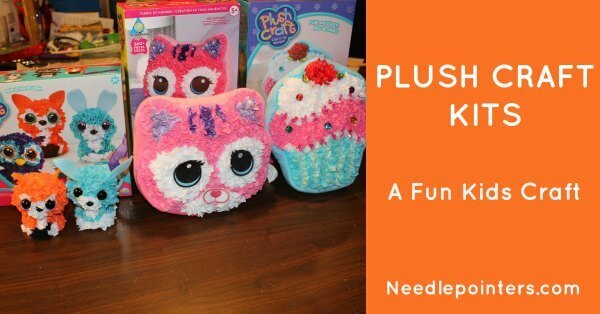 Learn more about these foam art and pom pom craft kits by watching our video or keep reading this post. Watch our Video Below or Click the link to watch Kids Craft Creatology Craft Kits Review in Youtube. 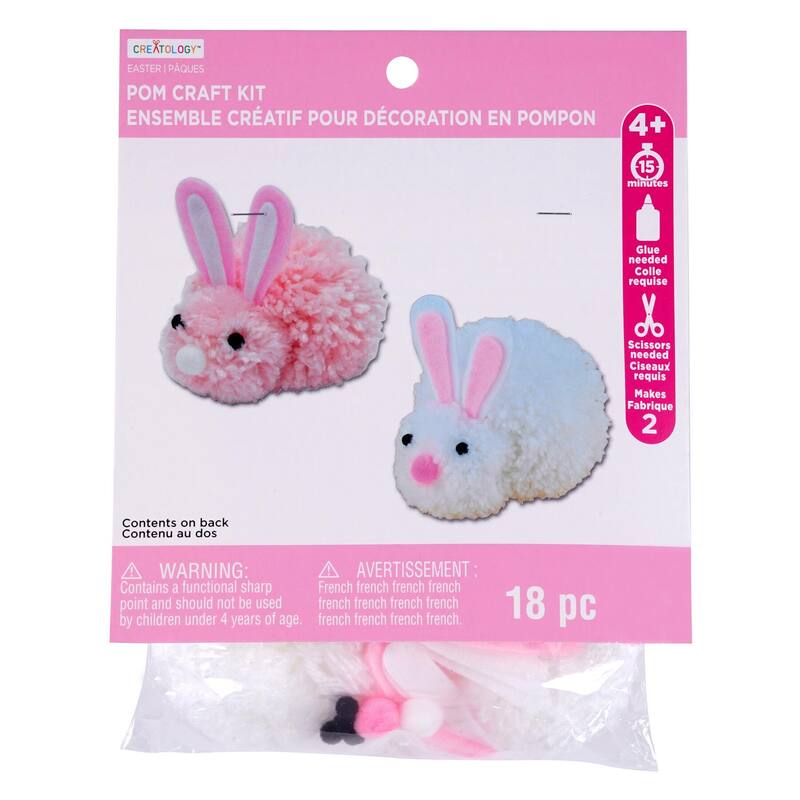 We purchased three Creatology kits from Michaels: Honey Bunny's Foam Art Kit, Pom Pom Bunnies and an Ornament kit which has turtle, lady bug and frog ornaments. We review each one below and in our video. 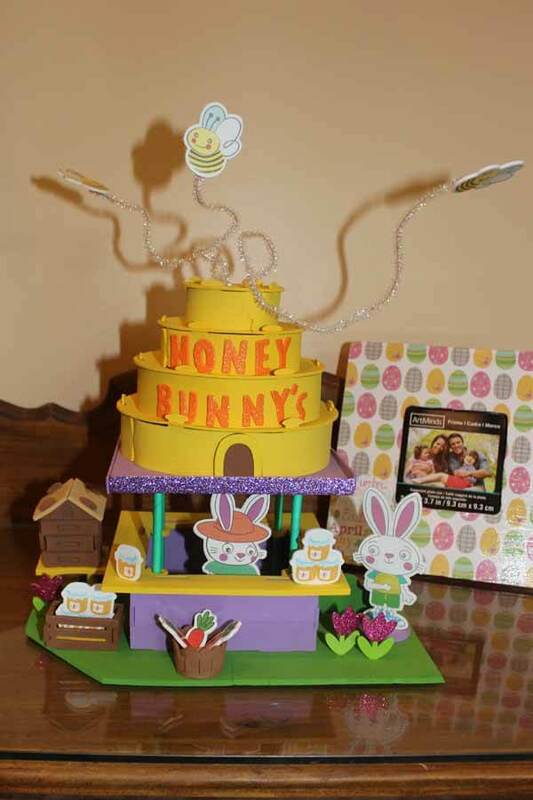 The Honey Bunny's Foam art kit is a cute kit and is for kids aged 6+. Kids at age 6 will probably need more help putting this kit together because it does have a lot of parts. It's a cute kit and it takes about 45 minutes to assemble. This is a photo of the finished kit. 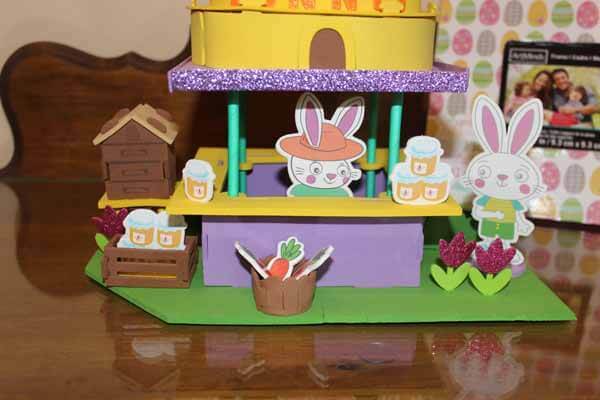 The kit features two movable bunny characters and two movable baskets. Some of the items, like the baskets, could be made more stable and permanent by using glue to make sure they stay together. The bunnies are selling honey from the beehive on the left. They also have carrots to sell. There are two baskets to hold the honey and carrots. Some tulips decorate the scene. The bunnies are movable and on a small platform so they will stand upright. 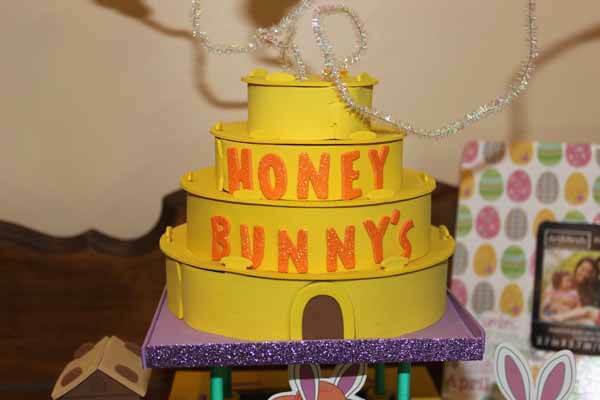 The Honey Bunny's booth is super cute with the big layered cake like hive on the top with an entrance and the words "Honey Bunny's" on it. There are three bees on twisted chenille stems flying around the hive. Kids can play with this after it's made and make up stories to go with the scene. This kit could be a lot of fun to make and play with after it's complete. It also makes a super cute Easter or springtime decoration for your house. The instruction sheet has picture instructions which can be a little confusing to follow at first since there are a lot of pieces. The pieces are identified first in the instructions. There are no indicators for the piece numbers on each of the pieces but the pieces are different enough to figure out which is which. The assembly starts with putting the stickers on the foam backing for the bunny characters, jars of honey and carrots. Then assemble the two baskets and put the platforms on the bunnies so they will stand. Assembly of the beehive to the left comes next. Once these accessories are together, start the booth. The base is put down and the booth is assembled on top with the four sides of the bottom of the booth first. The tabletop goes next and then the four poles are added which hold up the top part. Add the purple layer and then start assembling the cake like hive on top in four layers. 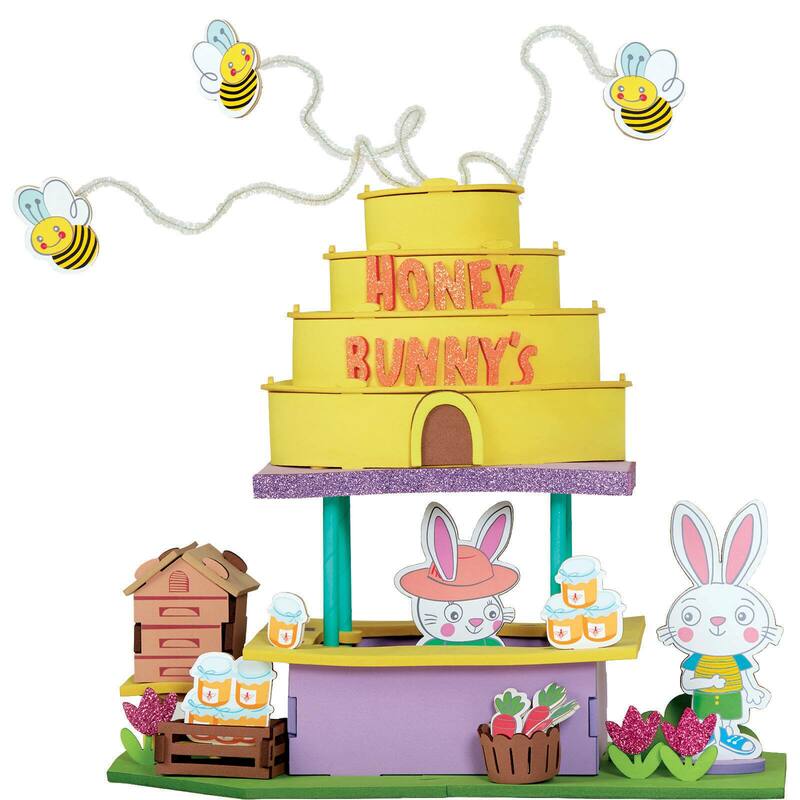 Decorate the cake, add the bees, flowers and other accessories to the base and it's finished! Follow the instructions carefully and you will have this together in less than an hour. If kids will be playing with the kit or even to make sure it stays together, you can use foam glue to hold pieces together more permanently. Enjoy making this kit! Find links to kits below. 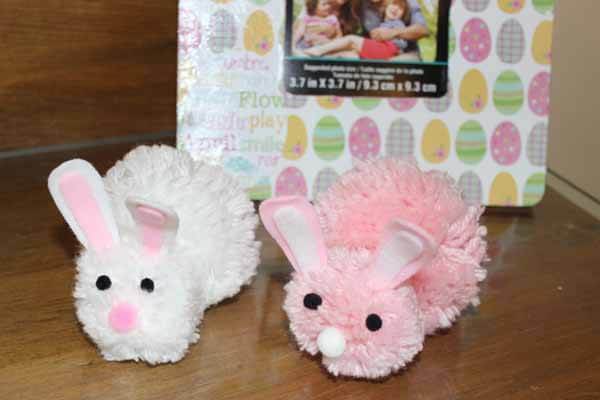 These pom pom bunnies are very cute and quick to make. This kit is suggested for kids four and up. The bunnies are very easy to make and come together in about 15 minutes. Glue will be needed and is not included in the package. The bunnies are assembled by gluing the body and head together. Glue the two parts of the ears together and then add the eyes and nose to each of the bunnies. Glue the ears on and they are complete! Find a link to this and other kits below. 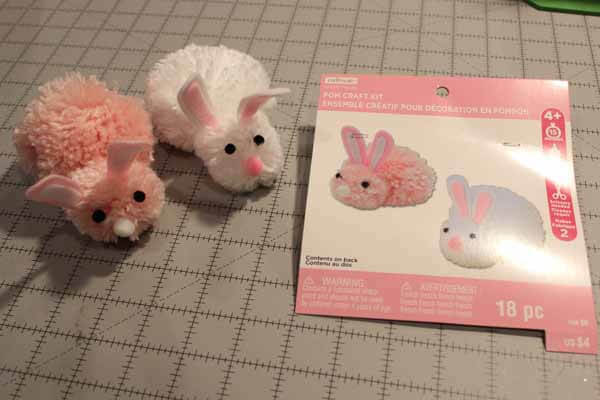 We hope you enjoy making these cute furry pom pom bunnies. These foam art animal ornaments are very cute and can be mixed/matched to come up with your own decorations. The kit comes with enough pieces to make four of each animal as displayed on the package. This kit is suggested for kids four years old and up. A four year old should be able to make these animals and be creative with a little help from an adult. Having enough pieces for four of each animal gives room for kids' creativity as they can use extra pieces on other animals and make it their own. My daughter made one of each in the way it's displayed on the package and then she decided to be creative and make another one in her own way. All of the pieces except the googly eyes are sticky back. So, these are easy to assemble by removing the backing and then sticking the pieces down. Strings are provided in the package so that they can be hung up. We did not add the strings to ours. Find links to kits like this one below. 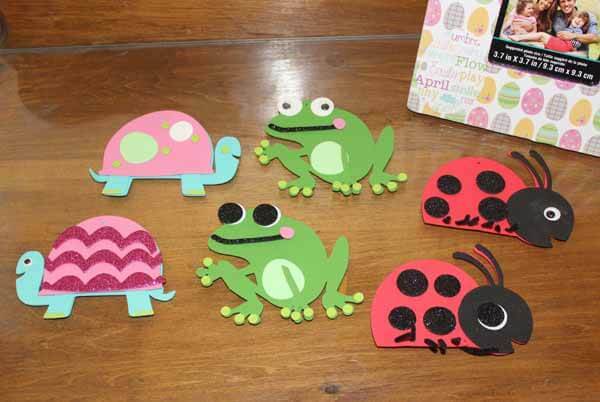 Have fun with the kids this spring making some fun animals. 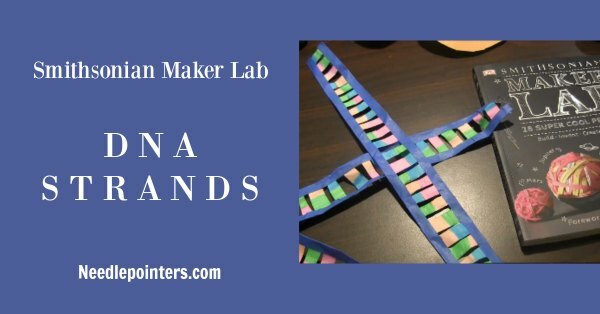 If you are looking for kids' craft kits, you may also be interested in these other kits we've featured. 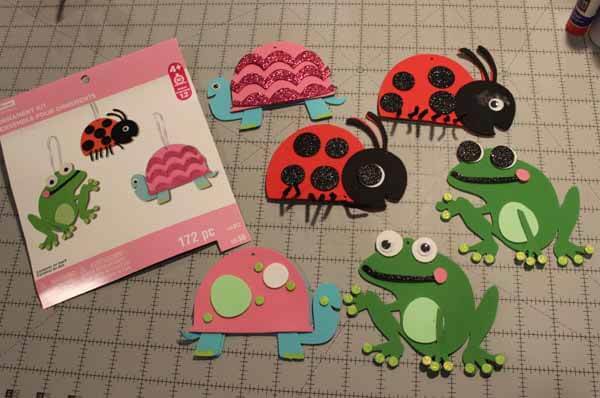 We also have many more craft ideas for kid in our Kids Corner Department. Click for more videos, free craft project ideas and inspiration. Look now and have something planned for a rainy day!